Christian Siriano pieces can now be found at Intermix! They aren't the same as the pieces he created for Bluefly last season - honestly I really like these better! I love the yellow and gray color combo and these seem a little less over the top and little more sophisticated. Prices range from $950 to $2,950 though, whew! Whoops, this expires today! Not sure if it will work for multiple uses, may be first come, first serve, but get 15% off your entire order at LnA Clothing with the code "REPEAT" at checkout. The latest in the slew of (obvious) women-shop-to-cheer-themselves-up scientific studies links PMS to increased spending. A new study of 443 women ages 18 to 50 shows that women spend more in the ten days leading up to their periods, known as the luteal phase. "Spending was less controlled, more impulsive and more excessive for women in the luteal phase," Professor Karen Pine, who conducted the study, tells the Daily Mail. Findings show that the 153 women who were in the luteal phase at the time of the study had less control over their spending habits. Two-thirds of them said they made impulse purchases and 57 percent said they overspent by more than $35. "[Shopping] is also a socially sanctioned way to deal with emotional overload compared to turning to drink or drugs," Professor Pine explains. I first saw this purse at Saks at full price and immediately dismissed it as too expensive. But I came across it on Bluefly last night for the 40% off price of $357, and now I'm sooooo tempted! The drawstring-style buckle top is super chic right now and I adore the slanted outer pockets! Plus, it's lavender, but looks totally neutral! What do you ladies think, still too expensive? I love the color of these heels, a light copper that's almost pink but still neutral. They look comfortable enough for the most avid of flat wearers and are only $82 at Urban Minx. It happens to all of us: we see something we possibly can't live without. It's perfect, it will enhance your life, it's just what you need to round out your closet, it will bring you that much searched for peace of mind you've spent your life looking for! And then... the most dreaded OUT OF STOCK. You're crushed, food tastes like ash and you wonder "Why bother?" This happened to me recently. I purchased an Herve Leger dress at Hautelook and just received notification that they will not be able to fulfill my order. I had been waiting all excited for weeks, and now find out I still won't get it - bait and switch! There's a storm cloud following me around, but I must persevere! Here are some thoughts / tips that will keep me going... but just barely! It was not meant to be. Tell yourself that things always happen for a reason. Maybe it would have made you look fat, they would have pinched your toes, maybe it would get ruined on your first wearing. There's gotta be a reason the fashion gods have forsaken you! You just have to have faith. Look at you saving money! If you're a shopaholic like me, your credit card is not always pleased with your actions. Now you can be responsible without meaning to, even if it's against your own will. Remember that what does not kill you will only make you stronger, and that you can get through anything with the support of your family and friends! ShopBop has a great interview with Paige Adams-Geller of Paige Denim, and I just had to share this one Q&A. What common mistake do women make when buying jeans? There are a couple mistakes women make when buying jeans. First, you MUST do the sit-down test. Make sure you have the correct rise for your body type. Depending on your body type (torso length, leg length, etc.) a mid-rise jean might fit like a low rise on you, so ignore the labels and get what fits right. And speaking of ignoring labels, I always tell women to ignore size labels. When trying on jeans, take in what you think is your size as well as the size above and below that. There are no size standards, so your size will vary from brand to brand and even from style to style within a brand. And feel free to cut the size label out when you get home. You’ll appreciate the fit more and concentrate less on the size label. I particularly forget about the sit down test :O Read the rest of the interview here. Seems like Christian Siriano is the most business-savvy winner of "Project Runway" so far. By pretty much shamelessly whoring himself out, he managed to keep himself in the public eye, and now Saks will be carrying his F/W line for its flagship store’s new third-floor boutique featuring up-and-coming designers! Take a hint, Leanne, I want to be able to buy your stuff too! Multiple sleeve openings? Hit the more views tab to understand, because it's just too much effort to explain but totally worth seeing! I see IDeeen at a Gen Art show last year, and I'm glad to see that the line is still innovating. This top is a costly $495 at Revolve Clothing. Pretty stripes of color in an ombre rainbow! Who says sweaters have to be for fall and winter? Rock this now for $148 at Ella Moss. I totally crave this coat, but I am not allowed to own anymore jackets! So buy this until it sells out and I'm no longer tempted! Buy at Goldyn for the sale price of $112. Everyone should own a cute pair of espadrille wedges for summer! These KORS Michael Kors ones are a great buy and on sale for $124 at Jildor. A private sale but you can get there via my Bluefly link! Extra 20% off! I'm a pretty big fan of Matthew Williamson, but I totally forgot about his upcoming collaboration with H&M! Coming April 23, prices range from $25 for necklace to $249 for a leather jacket to $349 for a beaded maxidress. It's definitely pricier than H&M's regular apparel, so I hope the quality goes up a few steps too! I can't wait!!! Leather continues it's reign of conquest in '09, and I think everyone should own a cute pair of tight leather pants! Well these are closer to affordable than most others I've see: Buy at Oak for $498. 39thandbroadway.com - Thought it was hard picking a job interview outfit, well, what do you wear if you’re interviewing for a fashion job? A Few Goody GumDrops - A Few Goody Gumdrops scoops an interview with handbag designer’s Be and D about the re-launch of the Garbo bag! Independent Fashion Bloggers - How essential is twitter to your blog? Or False Glitter - fall/winter 09 inspired hair style tried at home! reLYME - Studs were all over the runway this season…a few cheaper and more girly alternatives. Thrift Eye - Making a circle scarf, then turning it into a circle dress! Lately I've been craving a cartoonish-ly big cocktail ring, and this fits the bill just right! Buy it at eLuxury for the sale price of $165. Get 30% full-priced items at Queen Bee with the sale code "ff09" at checkout until Mar 29. I'd like to point out that savings at Yoox are up to 90% off until March 29! If you buy anything, leave a comment so I can shop vicariously through you! This jacket is a pricey $426 at Ssense, but if you can afford it it's soooo worth the price! Talk about something everyone will covet and probably land you on a street style blog somewhere. From what I remember, pretty much everyone wore a long gown for prom. But finding a cute one under $100 is pretty difficult, so I've assembled the following for all of you! These earrings are carved from recycled buffalo horn and as tres chic for summer - a perfect finish to your safari look. They're only $22 at Lulu*s Fashion Lounge, I may just have to buy them! Target is teaming up with Scott Mackinlay Hahn and CFDA award winning designer Rogan Gregory to launch Loomstate for Target, a limited edition eco-friendly fashion line for men and women. The collection will be available April 19, a few days before Earth Day, and prices will range from $15 to $45. The clothes look pretty basic, really the only hook will be that they're eco-friendly. Yikes, what a busy day, I apologize now! I love clutches with wrist cuffs, and this one at Kenneth Cole is $248. This slouchy tee would look great over leggings or super skinny pants. I just wish it came in more colors! Buy at Net-A-Porter for $95. On "Gossip Girl" this week, Serena wore a gold, embellished tank by 3.1 Philip Lim, which is already sold out near everywhere! This skirt kinda reminds me of it, and it's on sale for $118 at ShopBop. I went off looking for a brightly colored summer dress that you could wear weekday or weekend and found this gem by Karen Millen. I love the two blues together and the circle skirt, perfect for twirling. Buy at Asos for $260. Have I not posted this before? Well, it's cute enough to risk posting again, don't you just adore? I love the asymmetrical, laser cut tiers! Buy at Urban Minx for $143. Check out the 10 hour sale at Bluefly for BCBGMAXAZRIA! I've really been drawn to this style of cardigan lately, kinda long and slouchy with a Native American-inspired print that decorates a ski lodge. This one is only $85 at Revolve Clothing, a pretty good deal! Instead of minuscule swimsuits, I hear the style will be a slightly more covered up, retro-style this year! This one piece at Hayden-Harnett perfectly fits the bill, and comes in black or this fab boudior print. Buy for $218. I've never heard the term "shirt jacket" before, but that really is the best way to explain this coat! And if you don't already own a leather jacket, you definitely need to buy this, it's an essential part of a wardrobe! Plus this one is on sale at Goldyn, originally $1,043 but now just $313. If you're excuse me, I have to go donate my leather jackets so I have an excuse to buy this one! Get 50% off Ella Moss or LaRok purchases today only at Couture Candy with the sale code "ELROK" at checkout! These LnA leggings are just like the cutout leggings I've been obsessed with, except cheaper! You can pre-order at Singer 22 for $129... hmm, which do I get?? There's something about the heel ridges that make me think of Mad Max, am I insane? Originally $498, they're on sale at DC boutique Hu's Shoes for a more reasonable $299. 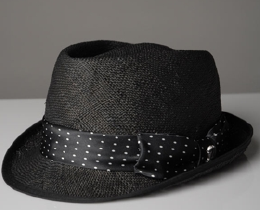 One of my favorite accessories for summer is a black raffia fedora that I pair with sundresses, swimsuits, everything! I prefer black straw, because it's slightly less beach bum-y. This one is only $29 at Tobi, so it won't be the end of the world if it falls into the ocean! Yay, something for my local ladies! The Fashion Clearance Sale is the premier event where shoppers can source a fantastic variety of fashion – current season, past season, and surplus lines of men’s wear, ladies wear, and accessories from local DC metro area designers. With everything from one-of-a-kind fashion and exclusive runway samples to branded designer wear and sportswear, there is sure to be something for everyone. At the Fashion Clearance Sale, you can place immediate orders on designer brand name labels at affordable prices, in a huge range of styles and types. Ten designers of casual, formal, sports, urban, outdoor, party & night wear, lingerie, and accessories are all under one roof at Hotel Helix, one of Washington, D.C.'s most accessible and popular venues. Belabumbum, L~Shandi Designs, CG Originals, Tu-Anh, Evelyn Brooks Designs, Xzuberance Apparel, Holland Cox, Yinibini, iKY Clothing, Yosoy Fashions. The Fashion Clearance Sale is FREE to the public and merchandise will be offered at 50-80% off the original retail price. Helix Lounge will be open for a cocktail hour to get a drink while you shop. I'm tired of statement bib necklaces, so I'm trying to move away into a more unique look while still maintaining impact! This piece is just the thing and on sale for $297 at RavinStyle. So I went on a mission looking for a cute, versatile summer skirt and I actually found something! This linen skirt is in a wearable neutral color somewhere between beige and gray, but has sequin detailing to punch it up! I would even wear this to the office! Buy at Yoox for $109. Take up to 90% off leather, fleece, silk dresses, tops, wool jackets, and everything else. Sat. March 28 noon-6 p.m.
b/t Hyperion Ave. & W. Silver Lake Dr. Via Daily Candy Via Eye 4 Style... wait, is that the right order? Either way! I like how the mid section of the purse isn't drawstring, just the sides! 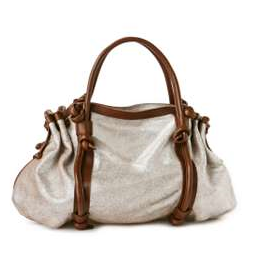 Plus, I rarely see brown and silver rocked so well together, so luxe yet perfect for everyday. Buy at Anthropologie for $288. Yay, long fringe to get tangled in your purse straps and caught in car doors! I blame Jil Saunder for this trend, but I have to admit it looks super cut when you twirl! Buy this top at Robertson for $189. I saw this modeled and it looks even better on! Bright fun florals for spring, you can find this gem at Charlotte Russe for $33. More pretty plaid for you! I'm loving these colors too, very wearable and soft, not lumberjack at all! I especially like the gathered neckline of this Vivienne Westwood Anglomania blouse, which you can buy for $278 at Far Fetch. Vote to Win a $1,000 Lucky Brand Shopping Spree! Three aspiring stylists got full access to the Lucky Brand showroom to put their spin on the spring collection. Vote for your favorite for the chance to win a $1,000 Lucky Brand shopping spree. A Few Goody GumDrop - A Few Goody Gumdrops asks…if you are coming apart at the seems then enter to win torn leggings from LnA! Capitola Girl Jewelry Blog - Check, Please! Fashion Daydream - What your didn’t see at Fashion Week: A behind the scenes look into fashion week, fashionistas en route to the shows and models being made up. Fashion Pulse Daily - reports on the latest colors for fall 2009 — the season isn’t comprised of various hues of black or even bright colors for that matter either. Shopping and Info - Shopping and Info found Gossip Girl scarves bags and jewelry oh my! Studio Purpura Fashion Blog - Shopping Hops in the Far & South East Asia! Photos to Come! Style Symmetry - Check out my interview with Jennine of The Coveted! what the pros do… - Spring Clean Your Makeup Kit! 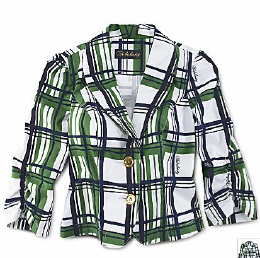 I was searching for the new designer collaborations (which I did not see) on JCPenny when this plaid blazer caught my eye. 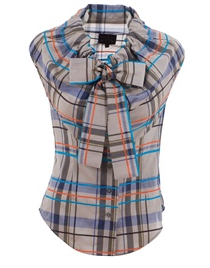 I really like the plaid print, especially the colors - very nautical! And it's on sale for $25, originally $50. Get 20% off all dress at Eye Candy Buy Candy with the code "DRESS" at checkout for the next three days! Definitely some great casual and cocktail options, but nothing for gowns if you're prom dress shopping. LOVE these leggings by Daniel Palillo, they're so fashion-forward I'm actually in pain not owning them! You can buy them for $175 at Fatal, and if they're still in stock come April they will be the first and only thing I buy! Silver cardigans are super versatile, and this basic one by Rebecca Taylor has a tiny bow detail to keep it from being boring. Buy at She Boutique for the sale price of $110. This coat has subtle military details, but is balanced out by the marigold / light blue colors, making it perfect for spring! Buy at Tulle for $93. Today is the last day to get 25% off any full-priced purse at Steve Madden, check it out! These baggy, dropcrotch shorts by Henrik Vibskov have a really interesting and unique look! Buy at Aloha Rag for $200. I'm a year-round boot wearing kinda gal, but I can understand how some people may find the look too warm mid-summer. But now you can get some airflow with these cutout boots by Jeffery Campbell! Buy at Bunny Hug for $168. Since discovering Haute Hippie, I've been quietly stalking many of their pieces, like this tutu minidress. I love the combination of the jersey tee-like top and the flared tulle, creating a relaxed ballerina look. Buy at Nordstrom for $495... I suppose you could simply pair a black James Perse tee and an actual tutu for the same look for less though! I really love the print of this swimsuit, so bright and colorful! I checked out the other print, which is a graphic black and white on one side, plain black on the other, and was surprised at how cute I thought that was too! Buy for $128 at Free People. After much staring too closely at my computer screen, I've decided the webbing detail in the center of this tunic has some sort of material underneath it. In some ways that's good, but it would have been cool if you could layer it over any bright top you owned. Either way, but at TopShop for $44.